Arne Jacobsen’s SAS Royal Hotel in Copenhagen was one of Denmark’s most distinctive and beloved examples of modernist architecture and interiors. When it opened in 1960 Jacobsen believed it to be an example of the ‘gesamtkunstwerk’ or ‘total work of art’ in providing an entirely immersive experience with bespoke design at every scale. Jacobsen designed every detail in the hotel for the owner, airline SAS, from the monumental facade of Copenhagen’s first skyscraper, down to the smallest details of cutlery and hardware, via specially designed furniture that have endured through the decades as icons in their own right – the Egg Swan and Drop chairs. This resulted is an unwaveringly modernist building in total harmony through exterior, interior and accessories. With much of the original design intent being lost to corporate fittings and furnishings over the years, the hotel lost its legacy as a ‘gesamtkunstwerk’. Only room 606 was preserved in its original design, in iconic shades of green. 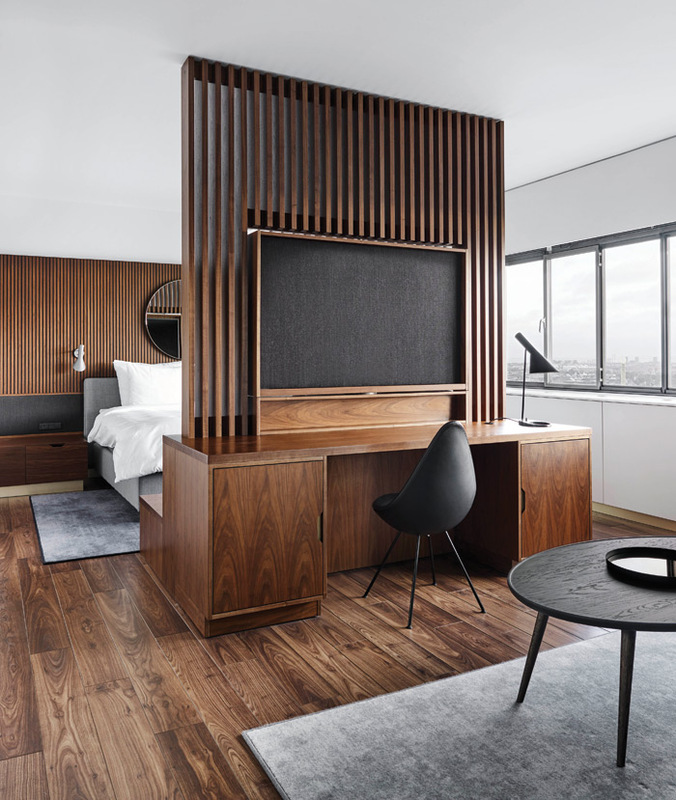 Now Space Copenhagen has refurbished the entire hotel, now the Radisson Collection Royal Copenhagen, to reinstate Jacobsen’s proposals in a contemporary setting. It has sought a balance between respecting the existing building and giving it new life that allows it to function better as a contemporary design hotel. Previously a destination for good modernist design, the hotel has been tackled by Space Copenhagen to return it to its former glory as a landmark for design connoisseurs internationally. ‘Our intention is to preserve its extraordinary character but we don’t want to turn it into a museum; we want to bring it to life for a new generation,’ says Peter Bundgaard Rützou and Signe Bindslev Henriksen, co-founders of Space Copenhagen. Reintroducing lost features, such as the leather wrapped handrails of the central staircase, Space Copenhagen has honoured Jacobsen’s original plans for the hotel. Alongside this bespoke new features have been designed – the Loafer chair and Amore mirrors series – which respect and enhance both Jacobsen’s existing pieces and the hotel’s legacy. Space Copenhagen’s mission was to design for contemporary life but with Jacobsen’s ideas in mind. 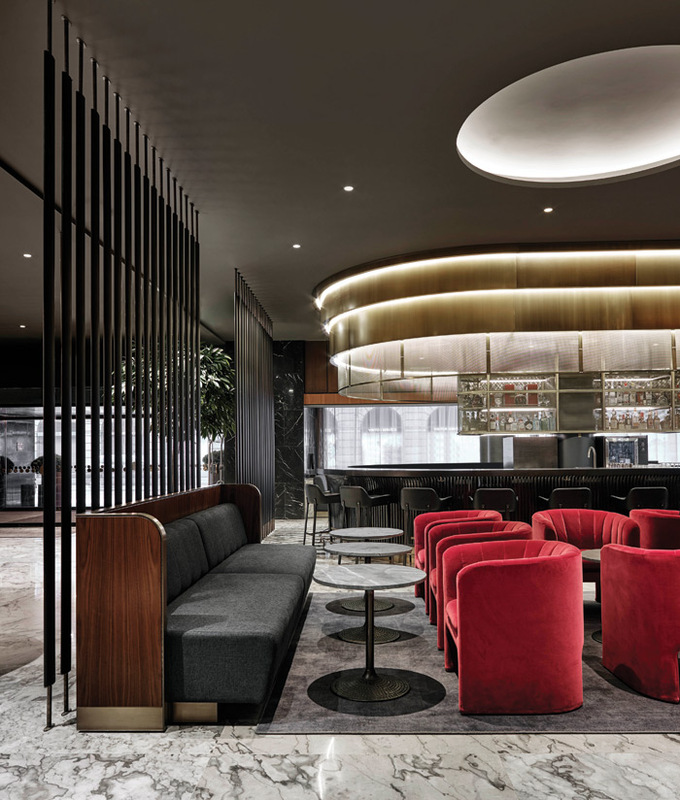 Jacobsen envisaged the lobby as a vibrant space that connects people. Space Copenhagen has reimagined the area to suit the way spaces are inhabited today. The bar and retail spaces have been removed to allow for informal areas for guests to gather and hidden corners in which they can relax or work. The space is furnished with a mix of Jacobsen’s original furniture pieces and Space Copenhagen’s newly designed pieces, including its semi-circular Loafer chair, which aims to complement and update the legacy of Jacobsen’s work. Original marble floors have been reinstalled across the ground floor, alongside wood and marble wall panels. 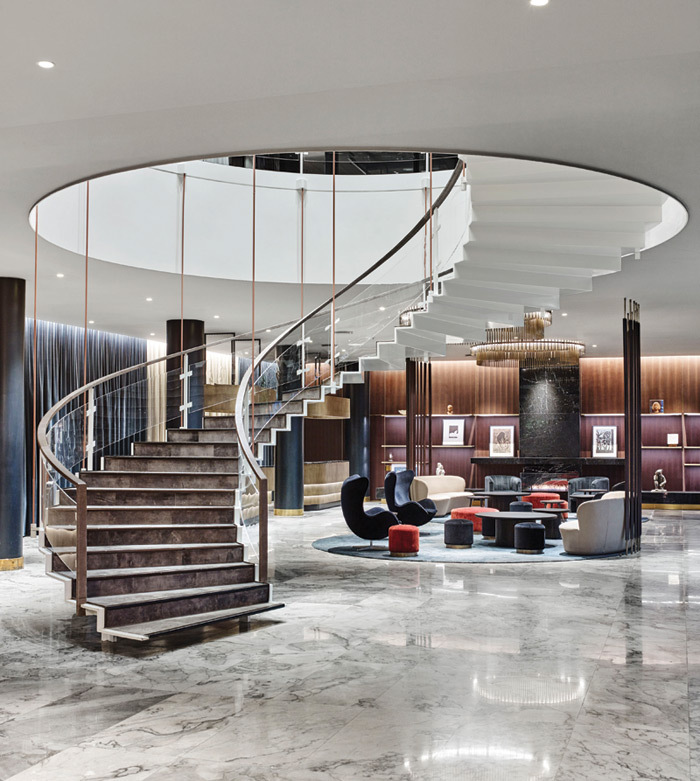 One of the hotel’s most recognised feature, the lobby’s spiral staircase has been restored by re-introducing original details such as leather wrapped handrails. Among the lights designed by Space Copenhagen for the hotel is an illuminated halo that hangs above the staircase, introducing a contemporary element to accentuate the space’s dramatic aspect. This continuity between the past, present and future is present throughout the hotel and was one of the strong design themes for Space Copenhagen, endeavouring to illustrate and enhance the hotel’s heritage throughout while adding contemporary twists. ‘With the architecture and interior design, our aim is to create a space and an experience that people remember: It is a place for people to celebrate memories of the past, and create memories for the future too,’ says Space Copenhagen. This approach looks set to put the hotel on the map as a design destination. The hotel’s guest rooms have been restored to the glory of the preserved room 606 but with further enhancements. Deep marble ledges have been added to the window frames to emphasise and draw the focus to the spectacular view acrosss the city. 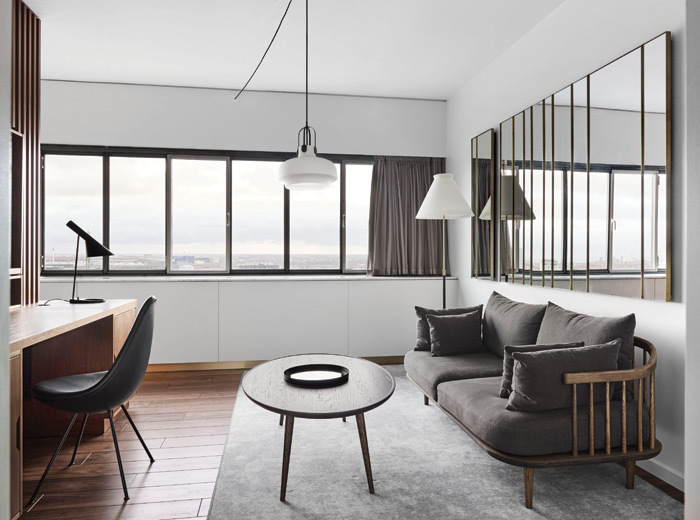 To further highlight the expansive windows and views, the Amore Mirror series was custom designed by Space Copenhagen for &tradition. The mirrors imitate the windows’ style and create a feeling of limitlessness across the capital city’s landscape. Jacobsen’s original furniture has been refurbished in shades of grey, brown and black, relinquishing the loud shades of green in favour of warmer shades. It is clear that the hotel has now been fully restored to the ‘gesamtkunstwerk’ that Jacobsen intended it to be. With his work being iconic of its time – his approach has been imitated all over the world in often unsuccessful bids for the results that Jacobsen achieved. It was due to this copying globally that the Royal Hotel begun to lose some of its wow factor, but Space Copenhagen has added it back plus more.